Does the city Lleida or Lerida, in Catalunya ring a bell for Sephardic researchers? 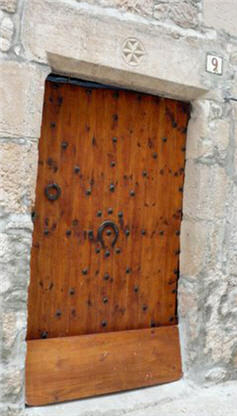 There were Jewish communities in nearby villages as well – such as Alfés – which has numerous buildings with six-pointed symbols – una estrella de 6 puntes – above their entrance doors (see photos at left and below right). Some scholars and historians believe that these symbols were substituted for the six-pointed magen david. In Converso communities elsewhere in the world – such as in New Mexico (according to Dr. Stanley Hordes and other historians), similar images are carved on gravestones. Lleida’s archives, housed in the Cathedral, are a treasure trove of documents for those who may have a connection to the ancient Jewish community. On my most recent visit to the archives – a few years ago – with my good friend and excellent researcher Maria Jose Surribas, they had just received a computer and, for the first time, were entering and cataloging thousands of documents. Maria Jose discovered a TALALAY (TALAYA, TALAY – there are various spellings) document dated 1358 in the archives, and others in towns not far away. Research in Barcelona’s Crown of Aragon archives turned up a few other mentions of the family through 1396. There is a Jewish cultural society in Lleida – TARBUT Amics Lleidatans de la Cultura Hebrea – providing programming, talks and conferences focused on the Jewish community. Just a few days go, on February 12, the group held a conference – The Jewish Community of Lleida in the Middle Ages: Between ‘Convivencia’ and Segregation” – announced by Dr. Joan J. Busqueta, Faculty of Letters, University of Lleida. For more information on Tarbut, visit the site at the link above, although it is mostly in Catalan. I would like to thank you again for the important information I received from you on the fnding of Ya`kov Forma in the town of Lleida 1358 and his signiture on the affadavit on bringing kosher wine to the Jewish communuity. Ihave not succeded to make any contact thru the Jewish Community in Istanbul who provided me with data on the Forma Family & Benforma just before the year 1900 and so on. I have no idea how to make this contact. The family Forma in Poland was almost completely annihilated in the “shoah”. There were maybe two or three survivers whose names appeared on “Yad v` Shem. The Family lived in Ciechanow, Mlawa , Plotzk, Prasnysz according to Jewish Gen & Jri . Trying to contact Reuven Artzi (Forma). I moved and lost contact.